Ever had an encounter with a Zero-doccus, a Karbo-nockus, a Moto-raspus, or a Moto-munchus? These fantastical creatures are some of the first Theodor Geisel, better known as Dr. Seuss, introduced to the world in the 1930s. But the beasts didn’t romp through the pages of his well-loved children’s books. No, instead, they were badgering hapless drivers and boaters in motor oil ads. Yes, decades before he published 1957’s “The Cat in the Hat,” Dr. Seuss made a living as an ad man. For his biggest client, Standard Oil Company, Geisel conceptualized elaborate advertising campaigns for Flit, a popular insecticide of the day, and for Essolube and Essomarine motor oil. Hundreds of such ad proofs from Geisel’s personal collection live at the University of California at San Diego’s Mandeville Special Collections Library, and can be easily viewed on their website. 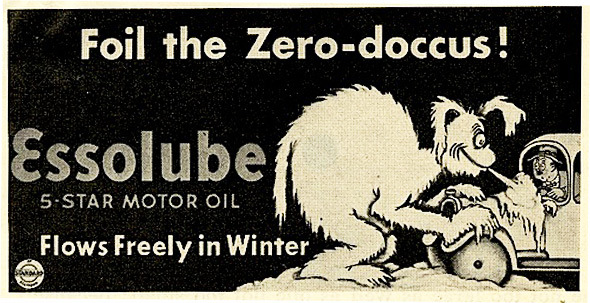 Dr. Seuss created the Zero-doccus beast for Essolube motor oil advertising. Images from the UCSD Mandeville Special Collections Library. Lately, these ads have been making the rounds in the blogosphere. To long-time fans of his books, they might seem, at first, like a shocking and disappointing sell-out. After all, isn’t this the man who wrote the 1957 anti-materialism holiday classic “How the Grinch Stole Christmas,” as well as the 1971 anti-consumerism and pro-environmentalist fable, “The Lorax”? 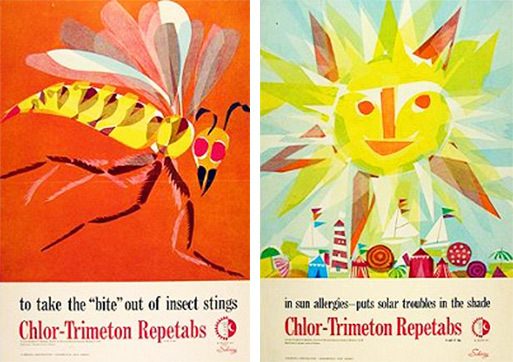 Eric Carle did a series of collages for his Chlor-Trimeton allergy tab ads. One of these caught the attention of author Bill Martin, Jr. Images used with permission from the Eric Carle Studio. In fact, many acclaimed 20th century children’s book authors like Leo Lionni (“Inch by Inch”), Simms Taback (“There Was an Old Lady Who Swallowed a Fly”), Rosemary Wells (“Ruby and Max”), and Gerald McDermott (“Anansi the Spider”) cut their teeth in advertising. Other artists created their characters for comic strips, paper dolls, magazine illustrations, or animations first, and then licensed them out for advertising. Just look at George Studdy’s Bonzo the dog, Rose O’Neill’s Kewpies, Richard Outcault’s Buster Brown, Walt Kelly’s Pogo, and the whole Walt Disney “Mickey and Friends” family. Dr. Seuss's "Quick, Henry! The Flit!" tagline was one of the most well-known ad slogans of the 1930s. From the UCSD Mandeville Special Collections Library. What’s delightful about the ’30s and ’40s advertising work of Geisel—who sometimes signed his work “Dr. Seuss”—is how clearly his giddy humor and unhinged imagination shine through. Even then, his mind produced surreal long-faced and sad-eyed creatures, like birds and bugs with long, sinewy necks and shaggy eight-legged mammals. Geisel gave them punny, rhythmic names that roll off the tongue, and often placed them in elaborate curvilinear architectural structures followed a logic of their own. “He developed his style, his sensibility about those creatures, even when he was in an undergraduate student at Dartmouth,” says Lynda Claassen, director of the Mandeville library, which holds more than 8,500 items from Geisel’s personal archive including his advertising work, illustrations, stories, and political cartoons for magazines like “Judge,” “Redbook,” and “The Saturday Evening Post” as well as sketches, proofs, notebooks, audio- and videotapes, photographs, and other memorabilia. 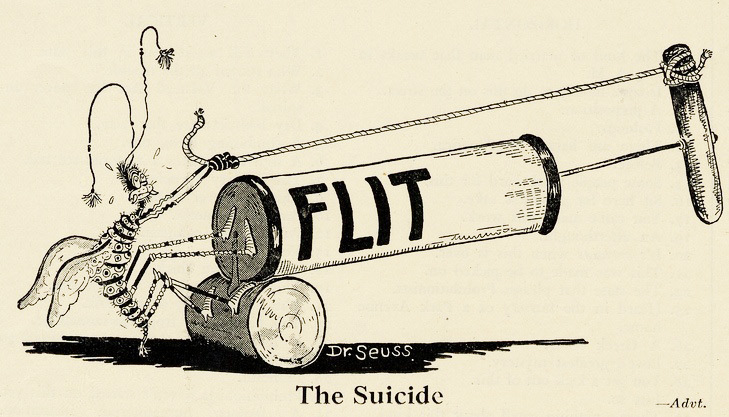 In his Flit bug spray ads, Dr. Seuss found humor in dark topics, like suicide. From the UCSD Mandeville Special Collections Library. Plus, his gift for fanciful wordplay, so famously put to use in books like “Horton Hears a Who!” and “Green Eggs and Ham,” manifested in his attention-grabbing ad copy. One of his longest-running campaigns for bug spray hung on the catchphrase, “Quick, Henry! The Flit!” Standard Oil, to their credit, seemed happy to let Geisel run amuck with his ad imagery and copy, publishing every brilliantly absurd idea that popped out of his brain. Dr. Seuss imagined this wild makeover machine in an ad for Daggett & Ramsdell cosmetics. From the UCSD Mandeville Special Collections Library. 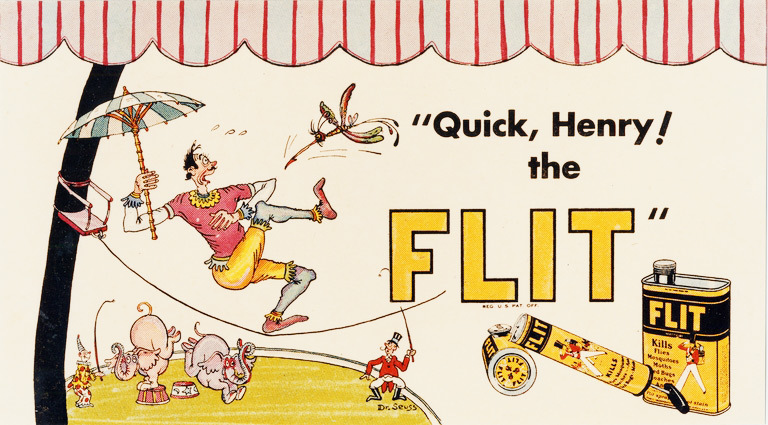 In Flit cartoons, you see a circus tight-rope walker tipping precariously to avoid a menacing stinger. An elaborate she-dragonfly with scrolling antennae is rumored to have poisoned many husbands. A bedraggled spotted bug prepares to commit suicide with a can of Flit. A cellist puts Flit-spraying contraption on his instrument. Flit is employed to fight dinosaurs, but only to sedate elephants and lions. Hilariously, Geisel’s people regularly spray themselves with Flit in the face (and even gargle it!) with no obvious ill effect. Geisel's ads for Holly Sugar are colorful and funny, but based on a simple, one-note gag. From the UCSD Mandeville Special Collections Library. By comparison, his colorful ads for Holly Sugar (“All it needs is …”) and his Warren Telechron clock cartoons are so simple, they seem restrained. For certain ads, it’s clear Geisel just provided the illustration above the company’s standard pictures—images of normal (for him) people doing pedestrian things like fixing the furnace. Geisel came up with this bizarre instrument for a pamphlet selling NBC TV program slots to sponsors. From the UCSD Mandeville Special Collections Library. But then, his inclination toward the ridiculous was never far away. In flyers intended to sell NBC programming slots to sponsors, Geisel promised TV performances featuring “Zimbaphones” and Assyrian choirs. Plus, he had the gall to sell ball bearings by reminiscing about early man’s “Dozerpod” (dinosaur bulldozer). 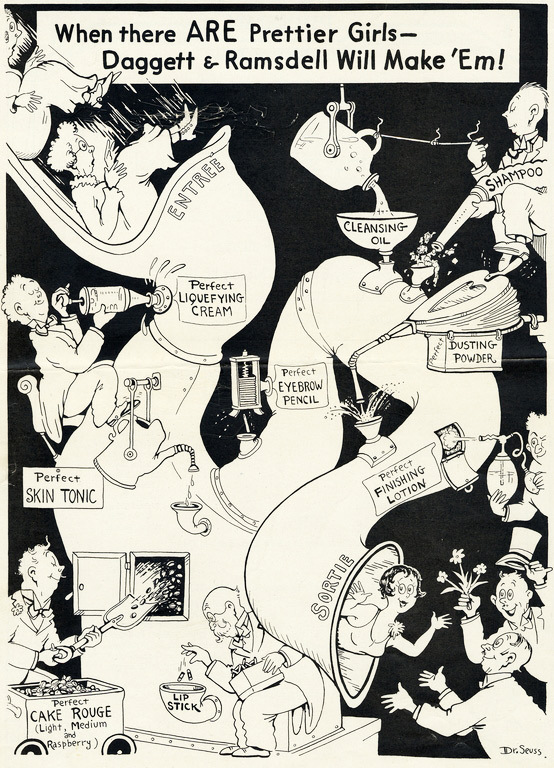 For Daggett & Ramsdell cosmetics, he depicted old biddies sliding into a convoluted makeup machine, and coming out like pretty young flappers zooming into the arms of waiting suitors. His little cats holding giant finger-point gloves first appeared in an ad for Ford. 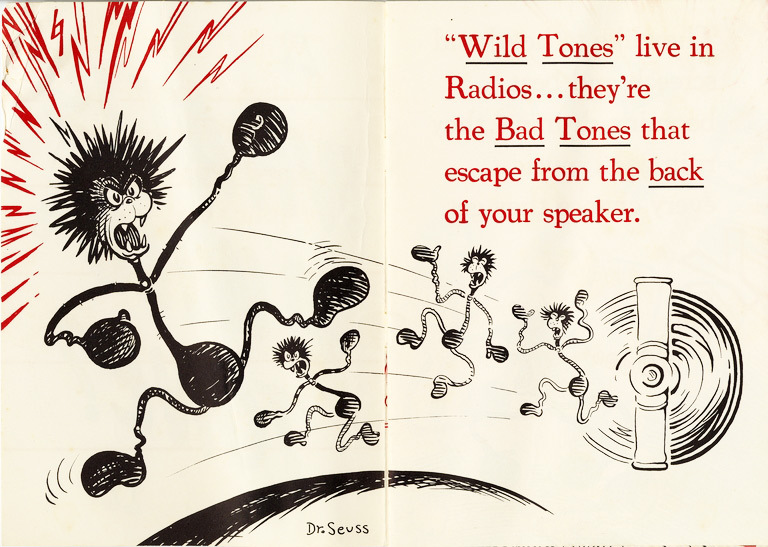 His pamphlets for General Electric and Stromberg-Carlson radios—titled “The Strange Case of Adlebert Blump” and “What is a Wild Tone?”—read just like his storybooks. 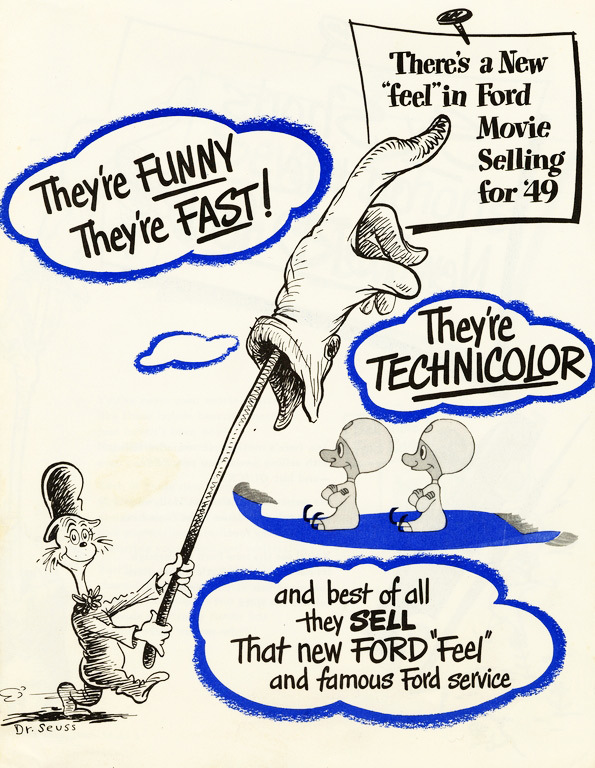 This Ford Motors ad, selling Technicolor advertising films to dealers, introduced a Dr. Seuss little cat with a big pointing glove on a stick. From the UCSD Mandeville Special Collections Library. Over the years, he made a Seuss Navy flag, photo-ready sculptures of “Marine Muggs” and Essie Neptune with her pet whale, as well as “Nuzzlepuss” ashtrays. He also published a “sea lawyers” newspaper, and wrote a six-act play called “Little Dramas of the Deep,” even building the scenery. 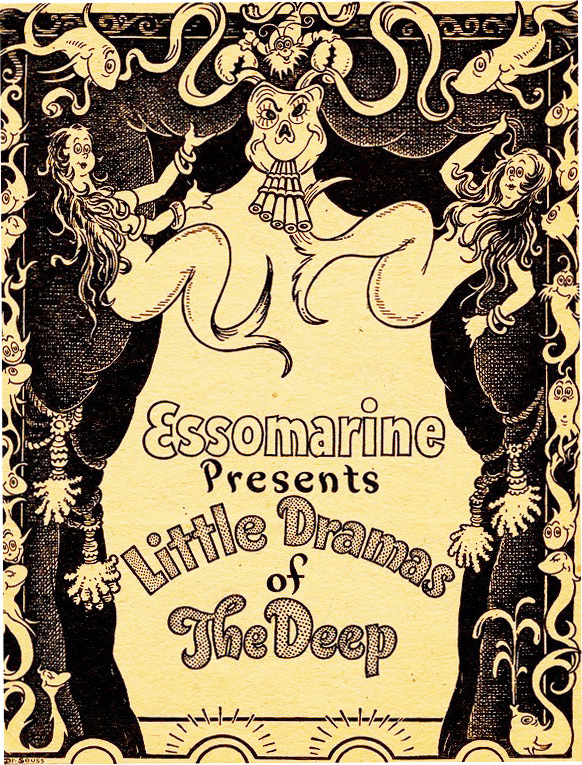 To promote Essomarine motor oil at the 1938 National Motor Boat Show, Dr. Seuss wrote a six-act mermaid-filled play called "Little Dramas of the Deep" and designed the scenery. From the UCSD Mandeville Special Collections Library. 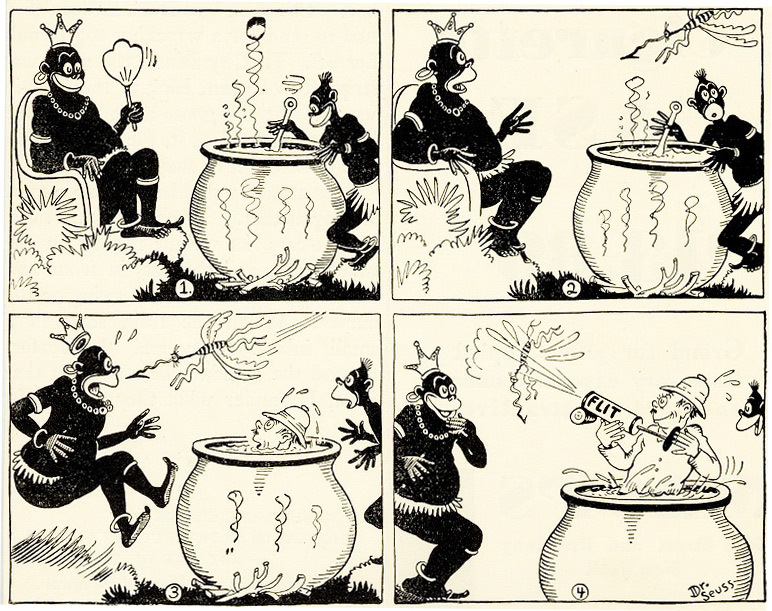 Outside of the advertising world, Geisel worked as a political cartoonist, starting as far back as his undergraduate days at Dartmouth and his post-graduate studies at Oxford in the 1920s. In the ’30s, Dr. Seuss attempted his first children’s book. This illustrated long-form poem, “And To Think That I Saw It on Mulberry Street,” was rejected 27 times before it was finally published in 1937. While he produced several kids’ books over the next two decades, it wasn’t until he limited his language to less than 250 simple words for 1957’s “The Cat in the Hat” that Dr. Seuss became a children’s literature sensation. 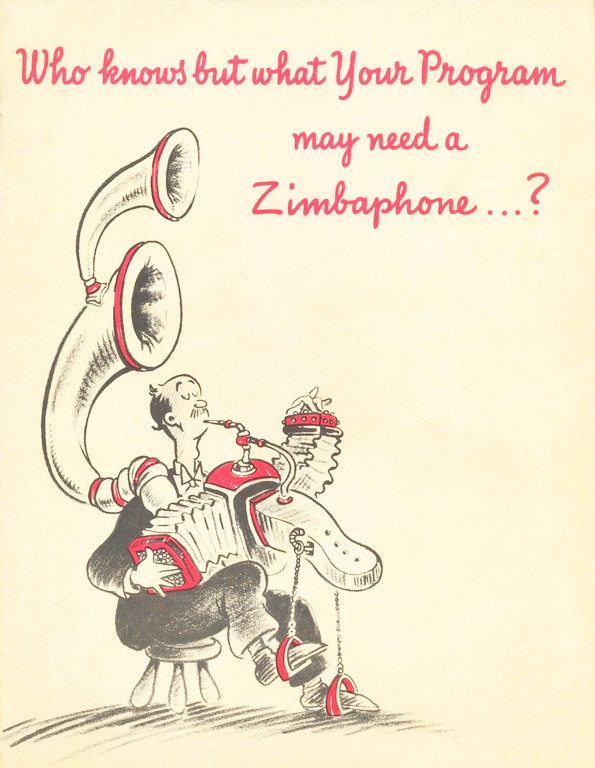 This advertising pamphlet for Stromberg-Carlson radios, titled "What Is a Wild Tone? ", bears a striking resemblance to Dr. Seuss's storybooks. From the UCSD Mandeville Special Collections Library. In the meantime, World War II captured his heart. As the editorial cartoonist the left-leaning New York City daily paper, “PM,” Geisel, a Democrat, promoted war bonds and railed against Hitler, Mussolini, and anyone opposed to U.S. involvement in the war, dissenters known as isolationists. By 1942, he was working directly for the U.S. Army in Frank Capra’s Signal Corps, and with Chuck Jones of Warner Bros., he made animated training films with a character named Private Snafu. In 1999, Richard Minear, then a history professor at University of Massachusetts, Amherst, caused a stir when he uncovered a cache of these political cartoons and published them in his book, “Dr. Seuss Goes to War: The World War II Editorial Cartoons of Theodor Seuss Geisel.” Many of these comics have been scanned and posted online by the UCSD Mandeville Library, which hosts a big exhibition of Seuss memorabilia at the Geisel Library every March in honor of his birthday and during each summer session. The current show, “Dr. Seuss’s Boids & Beasties,” runs through October 14, 2012. In the top cartoon, from February 1942, Japanese Americans line up to pick up dynamite, "waiting for the signal from home." 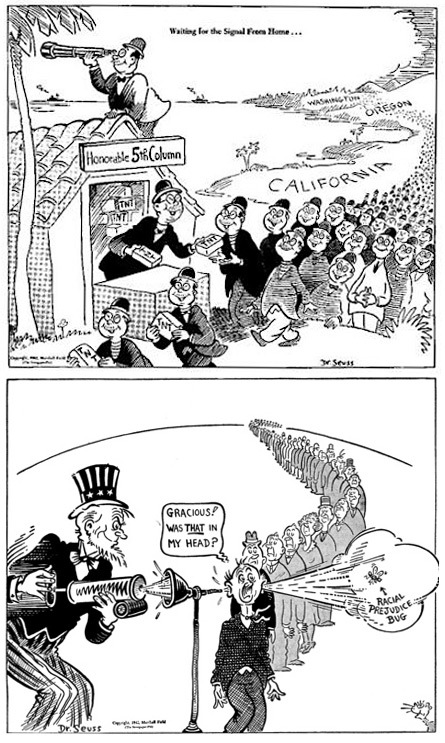 The cartoon above, from June of the same year, is titled, "What This Country Needs Is a Good Mental Insecticide" and shows Uncle Sam removing the "racial prejudice bug." From the UCSD Mandeville Special Collections Library. While some of Geisel’s 1940s cartoons expressed disgust at racism toward blacks and Jews, he didn’t shy away from drawing racist caricatures of Japanese Americans, whom he considered traitors, and he expressed his adamant support of Japanese internment camps. The UMass Magazine explains, “As a scholar of modern Japan, Richard Minear notes Dr. Seuss’s greater harshness with Japanese, as compared with German, subjects. But taken as a whole and with the exceptions he remarks upon, he finds the characterizations ‘remarkably gentle. '” And, by 1954, Geisel had a change of heart, writing “Horton Hears a Who!” as an allegory for the nuclear bombing of Hiroshima and the U.S. occupation of Japan after the war. He concludes that “a person’s a person,” and even dedicated the book to a Japanese friend. This 1930s Flit ad looks uncomfortably similar to minstrel-show blackface. Just a decade later, Dr. Seuss was decrying racism that prevented black Americans from participating in the war effort. From the UCSD Mandeville Special Collections Library. That’s the thing about Dr. Seuss. Throughout his life, he seemed eager to think about things deeply, and to grow and change—and then put a better message into the world. Many of his early ads for Flit feature appalling monkey-like images of black people, with white minstrel-show type lips. Typical of the ’20s and ’30s, these cartoons often show white safari adventurers running into “uncivilized” African natives. But Geisel became a voice opposing racism against blacks as early as the ’40s, and in 1961, his book “The Sneetches” asserted the need for racial equality for all. 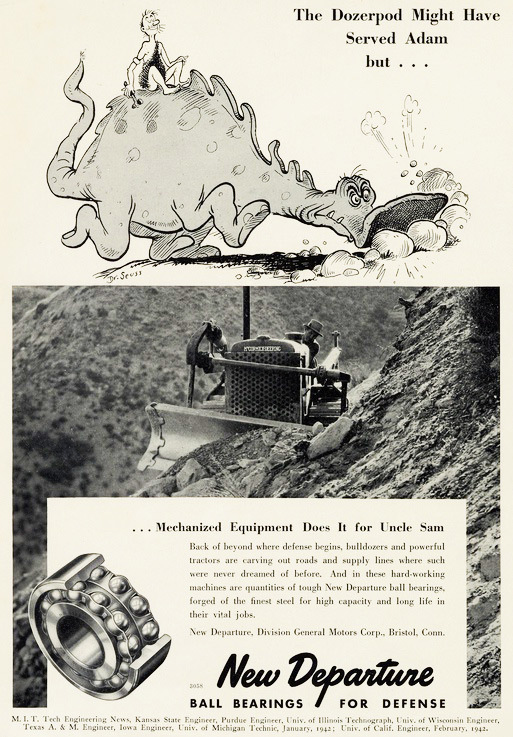 In this ad for New Departures ball bearings, a Seuss "Dozerpod" can't do the job of clearing roads for the U.S. government. From the UCSD Mandeville Special Collections Library. Similarly, it’s likely that as a young man Geisel—along with most 1930s Americans—was innocent of the impact that insecticides, oil spills, and auto pollution would have on the environment, as well as people’s health. To him, working in advertising was a fun way to get paid for his kooky ideas. 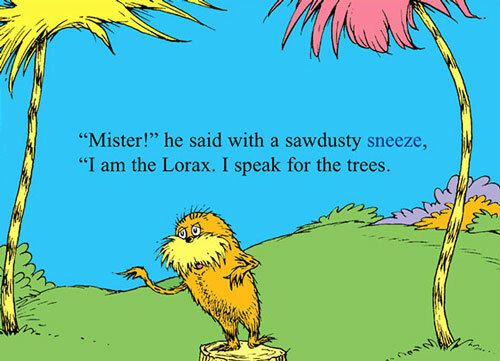 A page from Dr. Seuss's 1971 tree-hugging children's book, "The Lorax." Very interesting, I wonder how he would feel about the Nissan commercials featuring the Lorax that were playing before the showing of the Lorax movie. “ ” They were selling this dress with blood splattered on it.